A: Ideally, you want a room to “coordinate” but not “match.” Rooms that coordinate have varied textures, prints, materials, and tones that work together and appear balanced and cohesive. Rooms that match usually have all the same colored wood (usually all made by the same company and sold in a suite) they also have a matching sofa and loveseat or matching bedding that was sold in a set- heck, you know what matchy-matchy looks like so I won’t belabor it! Here’s a model-home-ish example thanks to JC Penney. The basics aren’t bad (we could totally work with the tan sofas and the side tables, but we’d bring in a bigger rug with a pattern or a texture and switch out the wood coffee table that matches those side tables for a round leather ottoman or even a few smaller rattan cubes. The major takeaway from this point is that rooms that look collected over time (and feature a variety of tones, textures, and materials) always look eons more stylish than rooms that look like they could have been purchased all at once from one store. But there’s a fine line between collected over time and mismatched and chaotic, as demonstrated by this tossed-together dorm room decor. Here’s a room from House Beautiful that totally gets it right. See how the side tables are painted cream but the coffee table is dark wood? Notice how there’s texture in the upholstery and even in the grasscloth wallpaper? See how the palette is pretty tight, just yellows and creams with a dash of dark wood and two pops of deep blue? Adding texture and subtle, layered interest is the surefire way to a warm and inviting space that feels finished yet anything but formulaic. Here are a few examples of some varied materials and textures that can be brought in to create the perfect foundation for a stylish space: leather chair + tan couch + black metal & glass coffee table + woven tray on the coffee table + dark wood TV stand + chocolate shag pillows + tan linen pillows + cream linen curtains + jute rug. Notice all the different materials and textures that will add that layered style that feels collected over time: wood with metal, linen with jute, leather with upholstery. But note that they’re still in a similar color palette: the black metal works closely with the dark wood and the brown leather, etc. Thanks to the coordinating tones of these foundation pieces, you can then add a few brightly colored accessories into the mix without fear of things looking too chaotic. It’s important to keep a tight color scheme in mind and not just go accessory crazy at Target. Take this room that feels a bit flat as an example (also from JC Penney). It’s not nearly as textured, layered and interesting as it could be. Just switching out the basic tan curtains with these subtly striped cream ones from West Elm, replacing the matching ottoman with this textured rattan table, and bringing in a larger patterned wool rug would add movement and texture for a serene and inviting space with character and interest. And to expand the palette and bring some color into the mix, some punchy silk pillows on the sectional and a brightly colored glass-based lamp on the side table would inject more of that je ne sais quoi! Prints and patterns are another way to add interest and style to your space- especially if it’s feeling a little blah. And when it comes to mixing patterns, there are a few ways to keep them from looking disjointed and chaotic, and our new lattice pillow in our bedroom conveniently demonstrates a few of our favorite pattern mixing tips. First of all, you want one of the prints or patterns to be a larger scale, more bold pattern (the pillow) while the other pattern is smaller in scale and a bit more subtle (the duvet cover). It’s usually a good idea for the smaller sized item to be the more bold piece (ex: a subtle small-scale patterned armchair paired with a graphic large-scale patterned pillow). Although we’ve seen some majorly dramatic rooms with large geometric or floral patterns in the curtains or even on the walls that knock our socks off, so it can go either way. The other thing to keep in mind when you’re mixing and matching would be to try to keep the patterns or prints in the same color family. Thanks to the similar tone found in both the duvet cover and the pillow, they don’t seem to be fighting each other and can peacefully coexist in our master bedroom. Right on John and Sherry! :) Thanks for explaining it so well ~ I’m a visual girl so I love that you added pictures. Hope you have a wonderful day! You did a great job of explaining that sherry…kudos to you girl..its very true..and I will say that I was a victim of matchy matchy..I think I want my bed set to be matchy..but I am learning not for the rest of the house. Thats why with my grandmothers vintage sofa and chairs that I have I wont get them all done because I dont want a matchy room..I want to get the sofa done and then add chairs.I have a vision. I am loving these email answered blogs! I agree! I hate matchy matchy, though I just realized in my living room, I have a dark wood coffee table and TV stand, two smaller dark wood bookshelves, two plants stands with dark wood. Eeek! Sherry, any suggestions? I have lots of other bright, light colors throughout as decoration so maybe it’s okay. We also love dark wood so assuming you have other items around to balance out all the dark (lighter upholstery, punches of color, soft textures, etc) it probably looks just fine. You could always switch out your coffee table for a leather storage ottoman (so functional and comfy) or even a woven one like the one we linked to in the post above (I love it so much that it’s making an appearance in a mood board any day now…). Happy decorating! Agree with everything you said. When we first got married, we purchased all matching bedroom furniture and a bedset in a box! Talk about matchy-matchy explosion. Recently we redid our living room and unknowing used some of your tips. Neutral couches and (tall) curtains, dark wood bookshelves and tv stand and then added pops of color in our rug, a coffee table painted bright white and anthro accessories on dark floating shelves. Still a work in progress but that is half the charm. Good Luck jamie! Super helpful! Now, I need to convince the hubby that match-match isn’t the way to go… :-) I always am telling him, “it doesn’t have to match, it just has to ‘go'”. You explanation will probably help him understand a bit more! Dude, are you guys reading my mind? I spent my lunch hour today trying to figure out how to do this with my new living room. I’m trying to mesh an existing paint color and couch color with all new accessories and tables. Thanks for the tips, another set to print out and reference. What would the rule be for incorporating a piece of black wood furniture into your dark wood pieces. I tend to go for the dark wood but occasionally find a piece I love that only comes in black. Does it just depend on where the piece will go in relation to the other items in the room? Or should I only incorporate black through other materials (like the metal you mentioned)? I hope this is making sense…..
We love to mix and match black pieces with dark wood! Black furniture might look a bit odd mixed with light wood (like birch Ikea chairs or something) but paired with dark chocolate wood tones they blend perfectly for that collected over time look. The only thing to be sure of is that the black piece isn’t completely different in style than the dark wood pieces (a little different is a-ok) since a big distressed black country-looking table probably won’t work seamlessly with a sleek & modern espresso wood TV table from West Elm. Hope it helps! I found your blog through the 48 Hour Challenge and I’m really enjoying it! I love the befores & afters. The two tips I have to add are: 1) It’s ok to let a room evolve over time. It may start out a little matchy-matchy but if you add and edit with care you’ll achieve an authentic layered look. 2.) Accessories are where you add the story or the heart to the home. Buy art from your friends, collect souvenirs when you travel or have a small collection of objects that have special meaning to you. Then your room will never seem impersonal or out of a magazine because it can only belong to you. I feel that I have known you both for a while – Love, love what you do. I read the blog everyday after my busy schedule at graduate school. I love the color in you have on your walls in your bedroom and was wondering if you wouldn’t mind sharing the name. Thank you. Hope it helps! Happy painting! What a great tutorial! I have to comment that I read and enjoy your blog every day. Thank you! Do you have a general rule of thumb for mixing patterned and solid throw pillows? I want to get some gorgeous green paisley Pottery Barn pillows for our new taupe couch, but I can be a bit heavy handed with accent pieces and therefore should not be trusted with these sorts of important decisions! What ratio do you guys think works best? Hmm, there isn’t really a hard and fast pillow formula since patters and colors can vary so much and create lots of different outcomes and combinations. I think in general that a semi-bright or busy patterned pillow plays best with other muted solid pillows or even with muted smaller patterns (ex: a faded taupe leopard print pillow looks great with a big, brightly patterned green and cream circle pillow since the leopard guy has a semi-subdued pattern without much contrast so the green and white patterned one is the star). In fact, maybe that’s a good rule of thumb. One pillow gets to be the star (just like the pillow in the House Beautiful image above). So if you already have brightly patterned or colored pillows on your sofa I would shy away from other brightly patterned or colored ones unless you’re a pattern expert (it can certainly be done, it’s just not always the easiest thing to master). Does that make sense? Just keep playing around and it’ll come to you. And save receipts so you can switch things out until you have the perfect balance of interest and subtlety! Hope it helps. Happy hunting! I read your blog everyday. I think you’re decorating geniuses! <<— I hope that made sense. You guys are the Best! As Always – Kudos to you for all the work you put into helping all of us with decorating our homes! Wonderful explanation! I often feel like the Jaime in my rooms as well. I want things to look like they go together without looking too purposeful or contrived. It’s not that easy– of course you guys make it look it is though! Wow! This is soooo helpful! Thank you! What would you guys suggest as far as knowing when there are too many solid accents in a room…for example: I have a colorful and big print/painting over our solid tan sofa; the painting has about five main color groups in it. I have two of those colors in the forms of solid silk pillows on the sofa. Would you add in a printed pillow too, or instead add in another “print” in a rug or in curtains? I go for the more contemporary Crate & Barrel style in less is best. But I don’t want to err on the side of things being too matchy matchy either. Would you let the big painting/print/art over the couch be the focal point and main “print” and build around that by adding in pops of colors from that in the form of solid pillows, differing textures, and curtains and decorative accents or would you add in more printed things too? Does that make sense? : ) Like how in your master bedroom, the main print is in your duvet cover and you sorta built around that? I definitely think one major statement piece (in this case, your painting) can be the star, however instead of bringing in other prints & obvious patterns (which could fight with your focal point and create a room that feels busy) you can always bring in some subtle textures just to add movement and keep things from feeling so… solid. Like a linen pillow in a solid color (the subtle lines that run through linen will give it some dimension and interest- and Crate & Barrel sells lots of solid pillows like that). Or a woven tray or basket. Or even a larger ceramic vase with a few different colors sort of running into each other on it (not obvious stripes or anything too jarring, but a soft “melting” effect with a few colors is always nice). For example, in our master bedroom we have a patterned duvet along with a bigger patterned pillow and a solid silk pillow… then we have the billowy curtains (some with a small crisscross pattern) and a woven jute rug underfoot along with a linen pillow on the leather chair and some mirrored sconces, etc. 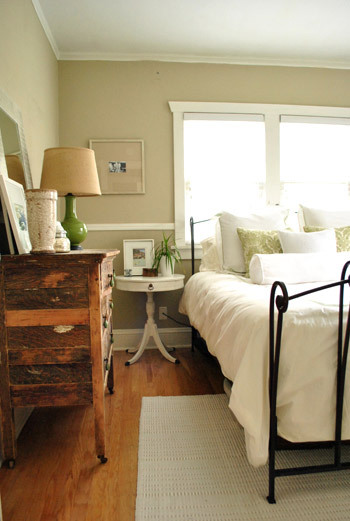 Lots of materials (mirrors, leather, upholstery) and textures (in the duvet, pillows, curtains and rug). It’s all about the mix! Hope it helps! I usually get the “big” things in a room right and then struggle with achieving that layered look with accessories so this post really hit home with me. Great explanations and the visuals are ever so helpful! This post comes at such a great time. My fiance and I are moving within the next two weeks and that means decorating time for me!! I am definitely going to remember these decorating tips. You guys are talented and I’m really happy you share your wisdom with us! Thanks! Great advice! Any advice for arranging art on the walls? I go back and forth between choosing large pieces, or a bunch of smaller ones, hung together. I want to avoid the room’s wall feeling cluttered, just as you wouldn’t want too many accessories cluttering your surfaces. Any tried and true tips for our vertical spaces? Hey Sherry, Thanks for the tips and help. I sooo appreciate and value it!! I was afraid I was missing something big by not having more prints in with my main painting, so I was relieved to hear what you said. Thanks! So it sounds like the key is making sure to have a lot of textures mixed in to add movement and lightness which steers away from everything being so solid and dull looking. And I should have said that our tan sofa is micro-fiber and the solid throw pillows are silk, the ones from Target. (Is the silk enough texture or should I look for the linen ones you suggested? Or are linen and silk similar? I feel so naive.) Thanks again for all your valuable help!! Your suggestions mean the world to me. ; ) I also have table lamps that have linen shades, does that count for texture? Would you suggest a solid colored but textured rug or a printed rug? What about curtains/panels? Maybe some linen billowy ones or printed ones? Would you go with a color that matches the sofa, like a tan, or a bold/popping color that is in the painting/art for the curtains/panels, or does that depend on your wall color? And after mentioning wall color, is there a rule of thumb that you guys base your wall color on? Like a color that you like or a color that is in your art or your accents and throw pillows or a more “basic” color that’s drawn from nature, not distracting, so it all blends in and is soothing? Or does it just depend on the room and what you like and the mood/style you’re setting? Thanks AGAIN for all your help!! I think it’s safe to say that there aren’t any hard and fast rules about what the curtains should coordinate with or if your rug should have a pattern or not. It’s all about the full effect, when you step back (and there are limitless combinations that can turn our perfectly, not just one right answer). For you curtains I would go with a color that relates to but doesn’t completely match either your art or your sofa (linen curtains sound LOVELY). How about a cream color to work with the tones in the tan sofa? Your linen lamp shades and silk pillows sound great together (nice mix of materials there) and adding either a textured (shag, jute, etc) or even a patterned (Persian, striped, etc) rug will really add more of that lovely layered vibe. There are any number of combinations of things out there that will look great. Just play around with things and have fun! Hope it helps! OMG, you are brilliant. The other comments say it all. I love example photos that you used, and how the one very well-coordinated room was described as “flat.” Because it was. Such great advice as usual. I <3 Young House Love! 1. Is it wrong to have a room all decorated and then pick a color you love from the color pallet of that room decor or do you base your decor and accents off what you’ve painted the walls or do you not even “match/coordinate” wall color to avoid bland? Would it be too matchy matchy to paint the walls a color that’s in a duvet cover or a piece of art/painting? 2. Do you suggest your starting point to be choosing paint/wall color or to find a main piece (art, quilt, duvet cover) and coordinate your wall color to that? Thanks again, I won’t bug you anymore after this! Blessings on the rest of your day!! You are a HUGE help and blessing to all of us! In our case we started with wall colors since we had a lot of hand me down furniture that we knew would be replaced (and empty rooms that we knew could be developed around our color palette). In many other cases (like Design Dilemmas for example) people already have colors and accents in the space that we’re working with and we help them select a coordinating paint color to go with those items. In short: it works either way! We don’t usually pick paint colors that “match” anything in the room exactly, but we often pick colors and tones that coordinate. For example, if the accents in a room are green blue and the room has a lot of tan (in the sofa or bedding) we might pick a cream tone for the wall so everything can live happily with that as a backdrop. We might also pick a lighter blue or green tone inspired by our punchier accents (we wouldn’t want it to be exactly the same color as them because we want the layered accessories and accents to show up and not disappear into the wall color if that makes sense. Thanks, Sherry! That really helps take the guess-work out of paint and wall color. Now I can proceed with greater confidence and knowledge thanks to you! I hope you have a wonderful rest of your afternoon!! This tutorial is amazing! It will help me so much. Our master bedroom is still a horrible mixture of my husband’s and my college furniture and I have been stumped at what to do. I’ve never liked the matchy-matchy that is on most furniture websites but am lost from there… I am also hoping to send you guys pictures of my living/dining room soon for a make-over. Keep up the great work! Thanks for all the tips! Wow! Who knew that an email would gather such great response? I would like to add that not only are you two creative but you are able to clearly and concisely state your thoughts. That is huge to me and therefore very helpful. You also serve up generous portions. Thank you! Quick question regarding matchy-matchy in the bathroom. Would you suggest a combination of bath mats and hand towels and body towels? Or all the same? Thanks! I’ve been addicted to your website for a couple of months and absolutely adore your site and your home. (I now have some of your prints from your shop and love them. Thanks!! )You mentioned not mixing black wood with light furniture and I am in the middle of that unfortunate situation right now! Until we find our just right living room chair we are stuck with our current Ikea one. I would love to paint it for the time being, but have no idea what to do with it or if it is even worth the time. (It is cream upholstery and faux wood, so not much to really we can do, right?) Any suggestions? Thanks again for your site. I look forward to it everyday! I am a lady of action, so I wouldn’t live one more day with that mismatched Ikea chair! It only takes a few bucks and an afternoon to remove the seat, prime that baby and slap on some latex paint. You could even recover the seat with some fresh new fabric for a total makeover! The great thing about sprucing up an old chair is that it goes from being something that you want to replace down the line to something that you’ll love for the long haul. So it’s a small time investment up front, but it saves you the expense of purchasing another chair in a few months. Gotta love a totally “new” chair on the cheap and one less thing on your wish list. Good luck! This was fantastic, guys. You really addressed one of my big fears about our remodel – I’m moving toward a very neutral color scheme, and I’m nervous that it will all look BLAH or that my accessories will look random. I think I have the tight color scheme part down, and I have plans for texture, but we have a *lot* of wood furniture, so I may need to spend some time thinking about materials. I don’t own a single metal piece, for instance. Not a one. I’ve been thinking of painting some of the shabbier dark wood pieces with a shiny, black paint. Maybe that would do that trick. Great post!!!! Thanks so much!!! I’m adding this one to my favorites! Ooooh, wait – I thought of a question: you mentioned letting one pillow be the “star”. Is that one pillow per sofa, loveseat, or chair? Or do you mean one pillow in the whole room? Right now I have two large cream velvety, pickstitch pillows on the sofa with one rectangluar brown and cream zebra print. Obviously, the zebra print is the star. On the loveseat, though, I have a separate star. There are two solid cream chenille pillows with subtle vertical striping and one silky cherry red oriental floral pillow. She’s the star there, *but* she looks great with the zebra on the sofa. Theeeeeen, on a dark tan chair in the same sitting arrangement, I have a cherry red needlepoint pillow – bigtime texture – looks great with the red floral and the zebra. These pillows are the only pattern in the room. So, is it okay to have 3 star pillows if they’re all on separate pieces? I definitely think there’s wiggle room in the “star pillow” rule, but a good guide might be to allow for one to two look-at-me pillows in each view of the room (ex: two showstopping pillows on the sofa that can be seen from one end of the room and a fabulous stunner of a pillow on the loveseat which can be seen from the other side of the room). Adding some bright punches of interest throughout the space will keep things balanced and cohesive, and it’ll keep chaotic pattern overload at bay (piles of patterned pillows can look fabulous but it’s an extremely “advanced” decorating move) while allowing for a bit of interest so nothing falls flat (your mixture of red floral and zebra sounds amazing). Hope it helps! I just found your blog and I am so thankful I did! There are so many amazing tips and tricks that I am going to try. I do have a question though. We recently purchased a chocolate brown microfiber couch and we love it, but now we have no idea what color/types of end tables to pair with it. We have a contemporary style room and home with the other colors in our room being tan walls, cream and red pillows and accents with a brown leather ottoman. Suggestions? Funny story: I’ve been obsessing over your site for about a year now and have got my sisters hooked on it, too. I always make remarks to my husband about something i saw or learned on “my home decor/redo site”. Today he sends me an email telling me of this great site he just found and that he knows Id love, too: younghouselove.com. HAHA. Awesome…. First of all, your hubby story is too funny. It had me and John cracking up. Love it! Second of all, navy painted wood plus dark espresso wood makes our mouths water. Seriously it’s an amazing combination. Just be sure to add lightness and vibrancy in other areas (like pops of orange and muted olive on the walls, in the bedding, etc- and even some lighter hits of white in the trim, lampshades, etc). Hope it helps! Hi, guys! I just discovered your web site today, and I think it’s great – what a beautiful house! I just bought my first condo a little over a year ago and am slowly but surely furnishing it, but not nearly as effortlessly as you guys seem to have done with yours! Because I have an unhealthy love affair with West Elm, I am fearful that my living room is becoming matchy-matchy! I was hoping to get your advice. I have a chocolate finish coffee table and TV stand from West Elm. Now I need an end table for a lamp so that I can get some soft lighting in the room. I’m afraid that if I buy the chocolate finish end table that I have been eyeing at West Elm, this will all look too much like a set, as those three pieces would be the only wood pieces in the room and they would all match. I would gladly look at other end table options, but I’m afraid that having only one piece that is different from the other two would just make it stand out like a sore thumb. I should mention that my couches are an orange/salmon color, I have a colorful wavy print rug with several textures within it, and a chair with a colorful circle print. Maybe these elements are enough to overcome the matchy-matchy curse? Any suggestions? Thanks for your help and the great site! Good question! What about a lovely glass and metal table that still comes in a dark finish to blend in with your handsome deep-toned wood pieces from West Elm like this? Hey, guys…love love LOVE your blog! Anyway, my husband and I are looking to buy new bedroom furniture, and I want to avoid the matchy matchy! When I told him this, he said “Isn’t everything supposed to match?” and I gave him the good ole line from What Not to Wear “It’s supposed to go, not match.” Anyway, I’m having trouble. I feel like in a living room, I could do this no problem, but with a bedroom, I still want things to match in color! but after that, I’m stuck. We need at least 2 nightstands (do they have to be the same?) and a fairly good size dresser. I want it to look like everything goes together, and I just can’t seem to do that! Help! Love both of those bed options. Great starting point. For the bed, the bedside tables and the dresser, they can all be the same finish without being from the same set, does that make sense? The subtle differences even in the knobs and the shape can really create a layered effect instead of seeing the same drawer pulls on three different pieces in the room. For the night tables I would actually do the same piece for balance (yes, they’ll match perfectly along with the bedside lamps on top of them) and for the dresser another deep-toned clean-lined piece will work, but since they won’t all come in a set from the same store along with the bed it’ll look great. For example, maybe two round chocolate night tables with white lacquered lamps will look awesome next to the angular bed along with an angular dresser across the room (with a bit white framed mirror over it to balance the white lamps). 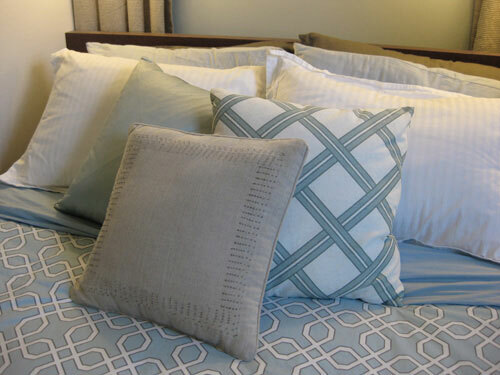 And of course layering in different bedding/pillows/art will really get rid of any cookie cutter feeling in there. Hope it helps! I am probably too late to this post, but I have a question about matching pillows to the room. We have leather chairs and a leather loveseat, dark wood coffee table, end table, and tv console. I lightened up the room with white cotton curtains on the french doors (our only source of natural light in the room). The room is a very soft cool green (Ben Moore’s gray wisp) with white trim and the carpet is a sand/light tan color, there are 2 lamps with ecru shades. Now, what colors do I need to use with throw pillows for the chairs and loveseat? Any advice would be greatly appreciated – I am horrible with interior design – not a creative bone in my body! Thanks! Anything light to break up all that leather and dark wood will really brighten things up and make the room feel more layered and dimensional. I would suggest anything from a few pillows in the light green family to work with your walls and maybe even a few crisp white ones and sand ones to layer in there (mix and match so things don’t feel too formal and staged). Hope it helps! I love the fabric on your duvet cover! Do you happen to know where can I find something similar? Hello youngsters we have black furniture (i.e. couch, side tables. tv console and a book shelf) in the living room. We are planning to paint it Glidden’s Juicy Cantaloupe, should we get a medium brown wood coffee table or a dark wood color like the one in the picture above? It’s all about personal preference. Both would work with your furnishings and the new wall color, although something in a medium brown tone might further break up all that black with a pop of lighter hue in the middle of the space. Hope it helps! Hello! I know you hear it all the time, but I love your site! I fell into the “matchy-matchy” problem. We have all new furniture, and since I was unable to find side tables that I liked, I ended up getting ones that match our coffee table and side table. Now it’s matchy-matchy central! We have a cream colored couch from pb, and a dark brown wood coffee table, side tables and a console table. Any suggestions to break it up to make it look less matchy-matchy? Do you think texture in curtains, a rug, etc will make enough of a difference? (Our walls are a light ice blue with a white brick fireplace. So far we have pops of aqua and light green.) Thanks! I would definitely start by bringing in texture in the accessories (curtains, throw pillows, a rug, table lamps, etc) and then see where you end up. You might want to switch out your side tables for square glass ones down the line, but even something as simple as placing a big round woven tray on your coffee table to break up all that wood could help. There are definitely a lot of ways to layer on the interest and texture, so see what you can do before making any major furniture purchases like new side tables because we’re betting you can make it work! Good luck! Thanks so much! Do you have any specific rug suggestions? We want something on the inexpensive side since we have a new kitten, and I haven’t been able to find the perfect one yet. Also, would you suggest matching or mis-matching lamps? Thanks again! We love the plethora of rugs on overstock.com so head over there and see what you can find (tip: get something a few shades darker or lighter than the couch and furniture or even go for a soft accent color to mix things up even more). As for lamps, we love how two matching side table lamps look flanking a couch (it’s all about balance) but bringing them in with an interesting material or color will set them apart from other things in the room so they don’t blend in and look blah (try glass based lamps, bright painted gourd lamps, etc). Hope it helps! I am absolutely IN LOVE with your blog. We just purchased our first home a couple months ago and your posts have been so inspiring. I just read the post today about matching metals, but figured my comment/question would make more sense here. We are currently having a matchy-matchy issue on our living room (uh-oh). We have a tan microfiber sectional, white cotton-covered (the IKEA Jennylund), and several pieces of black painted furniture in the room [small bookshelf (Taget), media console, and coffee table(both IKEA)]. In addition, we’ve got some black framed artwork and painted black shadow boxes with white accessories on the walls. We’ve got darker hardwood floors (still saving for a brown with teal/green/aqua area rug!) and our accessory colors are shades of green and blue as well as white. Here’s the big Q: How do we break up the black without breaking the bank? Is it possible to refinish – or would everything be too painted? 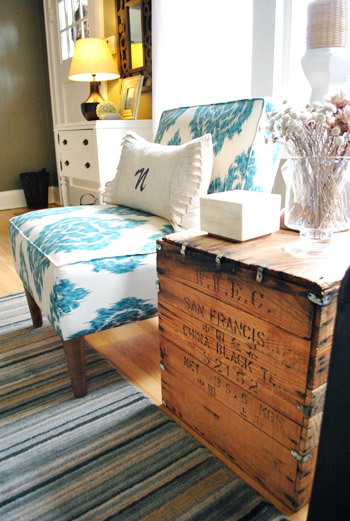 I’ve thought about ditching the coffee table altogether for a fabric ottoman (that I would hopefully stumble across at a yard sale and re-cover, haha) but would love some other ideas for the DIY gurus. Just play with things on the cheap and see what you like. A quick way to break up sofas and chairs are colorful pillows and even consoles and other accent tables can be fitted with cheap fabric runners (you can even cut yards of burlap from a fabric store and keep the edges raw to create gorgeous textured homemade runners). As for switching out the coffee table for a fabric ottoman, that would also be a great way to break stuff up and other things like large trays (in another color) and even big hardcover books can add even more layered color and style to keep things from looking flat. Hope it helps! I have been glued to your blog since a friend recommended it to me a few weeks ago. 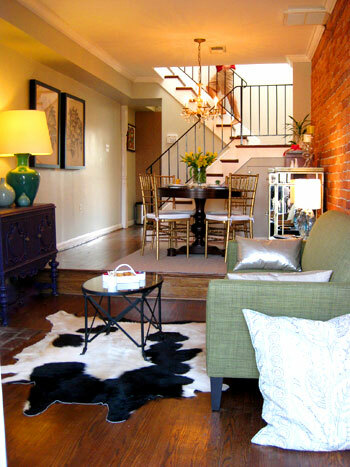 I love your style and amazing home make-overs! We are in the process of remodeling our bathroom, that looks like it’s the same size and layout as yours (only flipped). I’m so excited to see your finished room (and ours too, but that may take a few months at the rate we’re going). My husband and I have been in our first home for 2 1/2 years, and are taking on small projects to make some updates here and there. My question has to do with living room decor. I have finally decided to sew slip covers for our couch and love seat (a large undertaking, I know). They currently are a big floral pattern (given to us by my parents), therefore all our decor had to be neutral and subdued, due to to the overpowering floral print. The living room is painted a light golden-tan with a mocha accent wall (colors we both like). I am planning on covering the couches in a tan khaki fabric, and adding some accent pillows in brown, maybe green, and even a pattern or stripe. I’m just afraid that the room is going to be “too tan” or too neutral once the accent rug, walls, and soon-to-be couch are all in the light-tan family. I am contemplating making the bottom couch cushions a dark brown with the back pillows the light tan, but I don’t want it to look like circus furniture! Any suggestions? I really like the living room photo you referenced from House beautiful, but I don’t know if I could pull that off. I want it to be fresh, modern, and beautiful but there are SO many fabrics to choose from. As for your living room, bringing in colors and patterns (pops of green, stripes) in the pillows and accessories (even green glass-based lamps would be great!) will definitely keep things from getting too tone on tone and monochromatic. And the idea to do darker cushions would also be fun so feel free to drape fabric over your sofa to “test” it out and see what you think! A lot of times its the art work, trays, vases, pillows, and other accessories that break things up and add texture and interest so even in a room with neutral walls and a neutral couch it never feels boring (both of our living rooms have neutral sofas and wall colors!). Hope it helps! Aside from buying new furniture – how do I make it look less matchy match? We have a large floor mirror in that room that is made out of a bronze steel and a black leather chair. Aside from that it’s my “set” of furniture. Accessories are the answer to layer in varied textures and tones! Try a woven or patterned rug underfoot, plants to break up all that wood, varied fabrics in the pillows on the bed instead of a bunch of coordinated ones (here’s a post on that subject) and colorful vases, candle holders, art and other accents to continue to add dimension to make the space look less flat and predictable. And have no fear about matching nightstand lamps, we actually love two big statement lamps that match on either side of the bed. The key is that the lamps are a varied texture/tone than the side tables and other furnishings (thinks glass based lamps with woven shades or chrome based lamps with soft green shades) so they again add more interest and varied texture/tone to the space instead of blending in with all that matching furniture. Hope it helps! I was wondering if you could give me your opinion where we have gone wrong in our lounge project and help with furniture ideas. I don’t know how to get the pic to upload to show you so i’ll just describe it. It’s painted white with a black accent chimmney breast (no fireplace anymore). We have a black corner sofa and deep red carpet.All the trim is painted gloss white. As for replacing the carpet with something more neutral, it would probably make the room more cozy and welcoming. Then you could get wood units and be well on your way. Hope it helps! I’m having a major struggle. We bought our first home in April, and I’ve been trying to bring in furniture a little at time (as budget permits). I first bought a Room & Board Grove console in walnut at a sample sale. It has an oil and wax finish, so it’s matte. I then fell head over heels in love with a vintage dining table with six chairs. They are also in walnut, but with a lacquer finish that makes the wood look slightly warmer. They are right next to each other in the dining room, which feels a little weird, since they mostly match in tone but not in finish. Which brings me to my main problem, which is that the dining room is mostly open to the living room (it’s set off to the left, but there’s a large opening between the spaces). I have mostly used furniture from college that I’m working toward replacing, but I recently bought a Crate and Barrel Petrie chair at a sample sale in *sigh* brown. It’s a beautiful chair but it’s starting to feel very flat in here. The walls are white (which I love and chose, so I definitely want to keep it…I think) and I’ve added some pops of blue through pillows, art, and accessories. The carpet is cream and it’s pretty terrible, but we can’t afford to change it at the moment. Now I’m trying to buy a sofa, and I’m worried that I’ve severely limited my color pallette by buying the brown chair. Can you offer me any guidance. I know the exact sofa I want (the Hawthorne from Room & Board), but I can’t decide on a color. I could definitely have it custom upholstered is a fabric other than those it comes stock-plus in. Yikes, this is a long comment. Can you offer any guidance for a sofa color? – Grab a sofa in a timeless and classic color like cream, tan, or even light mocha (definitely a few shades lighter than your chair). This will add definition immediately and will never feel dated. – Bring in some accessories to break everything up. If you’re noticing things like “everything looks so brown” then adding a light blue pillow to that chair and some pretty blue and cream colored vases to the top of your console will shift the focus to the pops of accent color and away from the tones of the wood. 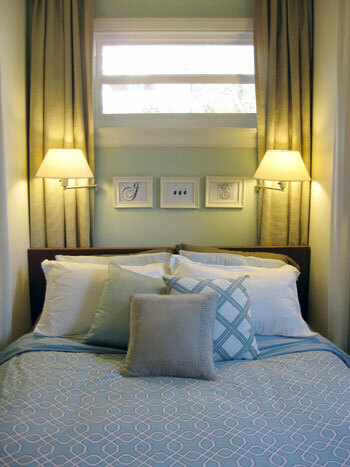 – Hang curtains in a color (not white since the wall is white) – maybe tan or wheat or even soft blue. You’d be amazed at how much they upgrade a space and make it feel polished and lovely. – Introduce art and even an area rug (overstock.com has affordable ones) to the living and dining area for more eye-candy that keeps your brain from lingering on small things like matte and lacquered finishes. Items like these can definitely live in the same room, that room just needs interest and accessories to feel fully dressed and deliberate. I’m not sure if you check back on old blog comments, but i’m hoping you do. I’m sitting here looking at my bookshelf, which is full of books – and I’m wondering how you guys organize book shelves. I looked through the pics of your house and only saw a few books on tables and such. I think I’m going to move them to my spare bedroom/office but would like to keep some in my room for reading at night :) How do you recommend organizing book shelves so they look nice, while they are also functional? Along one wall(all walls painted BM Palladian Blue), I have two dark wood leaning shelves from Crate and Barrel on one third, our gray cement floor-to-ceiling fireplace is in the middle, and the last third has the black Artesia lattice mirror from JC Penney with a large plant in a white IKEA planter beneath it. Most of our furniture is dark wood with a tan couch and cream leather chairs at a dark wood table. There are white/green/turquoise pillows and accessories around the room. On the opposing, very long, very bare wall from the dark shelves/fireplace/mirror, I was thinking of making three massive (80″ square) frames from 2x4s and leaving them empty. It probably sounds weird, but I already made one intending to stretch a canvas on it, and it looks good as-is. I was thinking of painting them white to add a little contrast, but my question (FINALLY) is whether it would look unbalanced to have dark things on one wall and white things on another wall, even if there are dark and white features throughout the room? Sounds fun! We like the intentionally empty idea- very cool and sculptural. As for the white idea, as long as other items in the room are white (and other items in the room are dark like the things on the other side of the space) it should all look a-ok. And of course if you do it and still feel that it’s off balance you can always repaint ’em- no biggie. But basically we think as long as the colors appear in the room a few times they’ll feel balanced and intentional instead of standing out and looking “wrong.” Hope it helps!